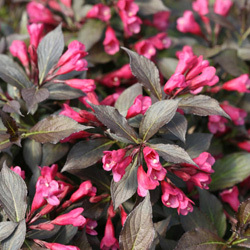 This weigela selection has a tight and upright form without the tendency to fall open from the center. Rich, dark foliage color is similar in color to that of fine burgundy wine, providing vibrant contrast to the deep pink spring flowers. 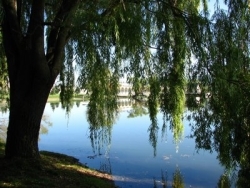 A slight shearing will encourage re-bloom through the summer. 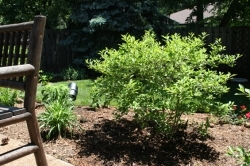 This deer resistant shrub is perfect in a container or perennial border. Hot pink buds open to pink flowers in May. Reblooms until frost without deadheading. Attracts hummingbirds. 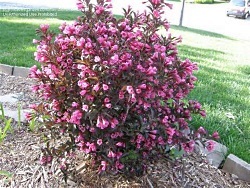 Sonic Bloom weigela are the strongest rebloomers ever seen in weigela. What a great choice for the foundation, along the driveway, as a low hedge, or even in a mass planting! The beautiful rosey-pink flowers that appear in the spring are striking against the deep purple foliage. Often re-blooming throughout the summer. Hummingbirds love the trumpet-like flowers. A very dramatic look when mass planted. 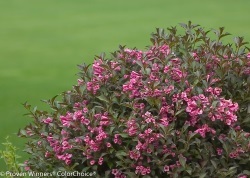 Sonic Bloom plants have the strongest reblooming seen on weigela, blooming in May and reblooming until frost. The flowers open pure white with a yellow throat and then change to pink, giving you multiple colors on a single plant. The flowers really pop against the bright green foliage. A hummingbird magnet. 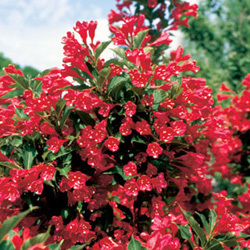 Makes a beautiful shrub border or foundation plant. This winterberry displays big, bright gold berries in winter. Berries attract songbirds and make a great addition to cut floral arrangements. This female winterberry needs a male pollinator, such as Mr. Poppins, to berry. 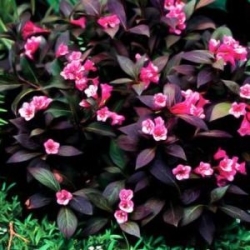 Can tolerate wet conditions making this an excellent choice for a water's edge or bog area. Deciduous native. 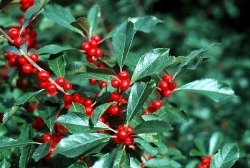 This winterberry is very adaptable to boggy soils. Excellent winter display of bright red berries when pollinated by a male winterberry, such as 'Mr. Poppins' or 'Jim Dandy'. Berries are often used in holiday arrangements and brighten up the winter landscape. 'Amethyst Falls,' like other Wisteria, is a strong grower, reaching 30 feet or more. It is, however, not invasive like its Asian cousins. This native variety is less vigorous and easier to manage. 'Amethyst Falls' will bloom its first season with fragrant, vivid, blue flowers that appear in spring and repeat all summer. The many attributes of 'Amethyst Falls' include its deer and drought tolerance. This vine is a perfect choice for pergolas, trellises, fences, and arbors attracting butterflies to your garden all summer long.